Say...what if Saru now develops love ganglia to replace those of fear? 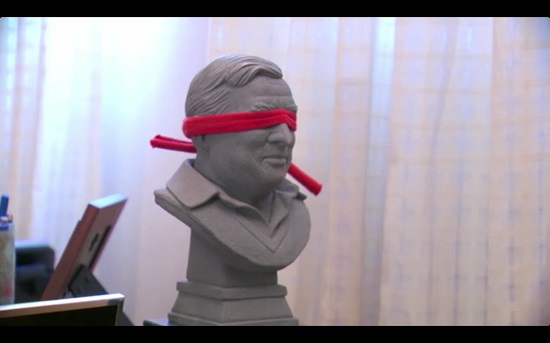 Somewhere, although he does not know why, Rick Berman finally takes the blindfold off of the Gene Roddenberry bust. I half worried that it would be a Monty Python-like "Well...I got better" type of thing, or a deus ex machina resolution. So... It's proper old school? saddestmoon and Hythlodeus like this. IDK - Given he's the ONLY Kelpian Starfleet doctors have had the chance to study in depth, how would they know as they have no baseline to compare? Saru IS the Kelpian baseline subject here; and hell, even 23rd century Kelpians didn't know this was the case. It just seems that somewhere along the line, some doctor, biologist, or somebody would have noted, "Hey Saru, these things in the back of your head don't have the same DNA as the rest of your body." Unless these parasites/symbiotes/whatever use horizontal gene transfer (like the tardigrade, but more so) to make themselves seem like they are fully part of the Kelpian's biology. It just seems that somewhere along the line, some doctor, biologist, or somebody would have noted, "Hey Saru, these things in the back of your head don't have the same DNA as the rest of your body." Having different DNA in one part of the body wouldn't necessarily mean all that much. Human genetic chimeras have been found (case of one woman with two distinct genetic lines in her blood cells, etc) and because no one had been looking until now, it's still not known how rare that might be. Yeah. I mean, in most cases I have to guess that someone would take a relatively non-invasive sample from one place - like saliva or a blood draw - and use that for DNA analysis. You wouldn't think to analyze the DNA separately in different portions of a person's body unless they showed signs of cancer or something. Interesting... I remember reading something about that. By the 23rd century (as depicted in Trek) they would surely have a much better understanding of such phenomena. I'm just thinking that with all that futuristic tech, routine exams would be way, way more thorough than what we're accustomed to today, with our primitive early 21st century medicine. Will all the bizarre stuff that they routinely encounter out there in the unknown, they would probably be looking for irregularities down to the quantum level, just to ensure the safety of everybody in the crew. exactly - didn't one (lt) cmdr scott talk about bio filters (for the transporter) in tos? They had to install special ones for the amount of std's Kirk picked up over the years. I have more of a "problem" with the idea that Kelpiens haven't accidentally figured out this big lie before. I put "problem" in quotes because I let far bigger issues slide, and I'll let that one slide as well. If I tried hard enough, I can find some sort-of-plausible reasons for Kelpiens not figuring this out already. Campe98 and grendelsbayne like this. Vger23, saddestmoon, Hythlodeus and 1 other person like this. saddestmoon, Hythlodeus and Kor like this. Like Pike's development, Number One's isn't all that great so far. At least what we know of Pike from "The Cage" is not as malleable as what little was accorded Number One, but she seemed pretty professional and austere as well in the 1964 pilot. But, as prequels go, STD still isn't worse than how a certain galaxy far far away's was. IMHO, YMMV. Charon i think was the ferryman not the actual death deity. I could be wrong though. Maybe there were different versions of the belief. Pindar, grendelsbayne, saddestmoon and 1 other person like this. Charon was also the name of the Emperor's ship. Pindar and XCV330 like this. From bullet train in TSFS to ferries in TNG to warships in DS9, Starfleet's most versatile beauty. Campe98 and XCV330 like this. Pindar, MSPpete and oberth like this.